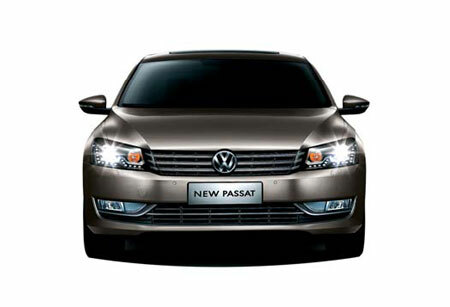 SHANGHAI VOLKSWAGEN LAUNCHED THE LATEST GENERATION OF THE POPULAR PASSAT on the eve of the Shanghai auto show. The model sells from 218,800 yuan to 310,800 yuan. The company says the 2.0 TSI version - which offers with peak power of 147 kW and maximum torque of 280 Nm - can outperform a conventional 2.8-liter engine. Volkswagen's DSG transmission is standard on the model. DONGFENG MOTOR CORP LAUNCHED THE NEW MODEL AT SHANGHAI AUTO SHOW with tag prices from 86,800 to 97,800 yuan. Powered by a 1.6-liter engine with maximum power of 78 kW and top torque of 142 Nm, the car can reach top speed of 183 km/h. It has two transmission options: five-speed manual and four-speed automatic. It is 4,336 mm long, 1,760 mm wide and 1,528 mm high. It has a 2,610 mm wheelbase. THE MID-SIZED FIVE-DOOR HATCHBACK was designed by a Sino-UK team led by MG's global design director Anthony Williams-Kenny. With its futuristic, streamlined body, cold metal finish, cold-light LED headlights and stealthy door handle, the concept reminds spectators of an aerial vehicle back from the future. Williams-Kenny said that when the car goes into production it will rekindle consumer passion for the MG brand. SHANGHAI AUTOMOTIVE INDUSTRY CORP DEBUTED ITS FIRST SUV MODEL - the Roewe W5 - at the Shanghai auto show. It is the premium SUV product among domestic brands carries competitive price range between 170,000 and 300,000 yuan. The model has a 2,740 mm wheelbase, which provide a spacious room for the driver and all passengers. With 193.5 mm in minimum ground clearance, a 520 mm fording depth and grade ability of 35 degrees, its off-road performance rivals the Jeep Wrangler, Hummer H2 and Land Rover Defender, the company said. MAKING ITS GLOBAL PREMIERE, the electric concept developed by the mainland-Taiwan joint venture Dongfeng Yulon takes its name from the combination of "neo" and "era" - representing a new era in zero-emission mobility. The 1.6-ton model accelerates from zero to 100 km/h in just 6.5 seconds and has a top speed of more than 150 km/h. Powered by a 48kwh lithium-ion battery pack, the car can drive more than 400 km when fully charged. It also features intelligent devices like brake override system, side view assist system, night vision assist system and lane departure warning system to offer driving solutions in all kinds of situations. THE FIRST MODEL OF THE JOINT VENTURE BRAND BAOJUN developed at SAIC-GM-Wuling debuted at the Shanghai auto show and is scheduled to soon hit the market. The Baojun 630 is equipped with a 1.5-liter petrol engine with maximum output of 81kW and top torque of 146 Nm. Both manual and automatic transmissions are available. Its average fuel consumption is 6.9 liters every 100 km. It also meets the Euro IV emission standard. The model is 4,597 mm long, 1,736 mm wide and 1,462 mm high. Its wheelbase is 2,640 mm long. THE CONCEPT CROSSOVER MADE BY DOMESTIC MANUFACTURER GREAT WALL MOTORS made its global debut at the Shanghai auto show. The company said the model combines the elegance of a business sedan with the performance of a sport utility vehicle. Its 2.0-liter turbocharged petrol engine produces peak power of 218 hp and maximum torque of 324 Nm. Another option is a 3.0-liter V6 engine. It is fitted with a six-speed automatic transmission. Spectators were offered a view of the abundant extras that will be on the future production model, including an adaptive headlight system, power-lift gate, paddle shifter, adaptive cruise control and rear seat DVD. THE NEW GENERATION TIIDA BUILT AT NISSAN'S JOINT VENTURE WITH DONGFENG MOTOR CORP, made its world debut at the Shanghai auto show. The car features an all-new X-tronic CVT transmission designed to increase fuel efficiency by 15 percent. It offers 1.6-liter naturally aspirated and 1.6-liter turbocharged engine options. The car is 4,295 mm long, 1,760 mm wide and 1,523 mm high. Its wheelbase is 2,700 mm, 100 mm longer than the previous generation. A total of 750,000 Tiidas have been sold in China since its arrival in 2005, a significant achievement in the mid-sized hatchback segment.